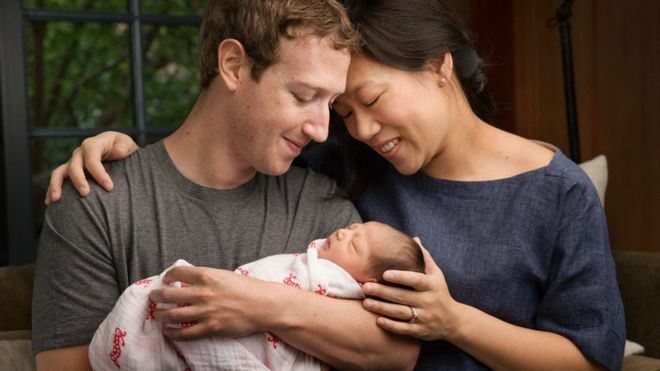 Facebook's Mark Zuckerberg and his wife Priscilla Chan say they will give away 99% of their shares in the company to good causes, as today they announced the birth of their daughter Max. Zuckerberg made the announcement in a letter to Max on his Facebook page. He said they are donating their fortune to the Chan Zuckerberg Initiative because they want to make the world a better place for Max to grow up in. Now THAT is very sweet! The donation amounts to $45bn (£30bn) at Facebook's current value. However the shares will not be donated to charity immediately, but over the course of the couple's lives. Were Zuckerberg to give away 99% of his shares immediately, he would still possess hundreds of millions of dollars. Ms Chan's worth has not been documented. Max was born last week, although her birth was only made public today. In his letter Mr Zuckerberg said the aim of the Chan Zuckerberg Initiative is "to advance human potential and promote equality for all children in the next generation". There's a chance you're eligible for a new solar energy program.